While EUR is being supported by the upbeat inflation figures, USD is under pressure due to Trump’s team accusation of Germany, China and Japan. 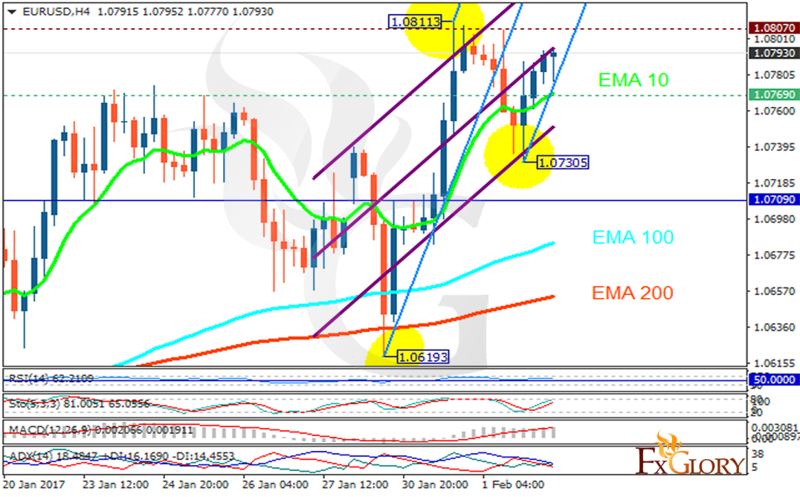 The support rests at 1.07690 with resistance at 1.08070 which both lines are above the weekly pivot point at 1.07090. The EMA of 10 is moving with bullish bias along the ascendant channel and it is above the EMA of 100 and the EMA of 200. The RSI is above the 50 level, the Stochastic is showing upward momentum and the MACD indicator is in positive territory. The ADX is showing buy signal. It seems that the pair is climbing up the Andrew’s pitchfork targeting 1.0850 otherwise it will drop to 1.0750.